If I'm interrupted, it's just a minor inconvenience, but not a disaster, because it's easy to get back where I was: that is, the paint has not changed consistency; the light has not moved. It was a black and white only computer at the time, but it kept me fascinated. My first Macintosh was a 128k machine which I upgraded to 512k the minute it became possible. Sixteen million colors in your palette are hard for any artist, especially a beginner, to turn down. That is, an artist who creates lots of work probably experiences prolific days and slower days. The artistic process in digital art is very much the same as for making other kinds of paintings. The key is in remaining just aloof enough from a painting so that you know when to stop. The paintings are transferred from my computer to a disk, and I can hand it to the printer this way; or I can modem the painting to the printer over the phone lines from my house in Hawaii. New Updates! (4/22/2019) We've been working really hard on completing our membership system so you can submit quotes and keep track of them. Once this is complete in the coming weeks there will be a lot more quotes by Buffy Sainte-marie and other authors. We've also changed the sorting on the site so you now see the latest Buffy Sainte-marie quotes first. 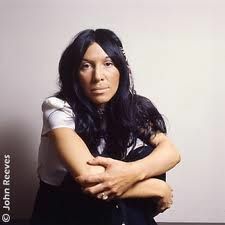 Our goal is to have the best Buffy Sainte-marie quotes on the web!